Until this evening I had never made nor tasted a nut roast before. Not terribly sure why. I love nuts and I love roasts. It has taken Johanna’s event to spur me into veggie action and, oh my, am I glad it did. My first attempt was (if you excuse my immodesty) absolutely delicious. Place carrots in a small pan of salted water and bring to the boil. Simmer until carrots are cooked through. Drain and mash the carrots with the tahini. Gently fry the onion and garlic in olive oil until soft and translucent. Add the carrot mash and fried onions to the breadcrumbs and cashews. Sprinkle with cumin, squeeze over lemon juice and season. Mix together well using your hands. Rub 4 ramekins with softened butter and dust with flour. Spoon in the nut mixture and press down firmly. Cook in a 180oC preheated oven for 30 mins. Loosen roasts with a knife and tip out onto a plate. Serve with a green salad side. I tag Lucy, Helen, Warda and Susan. Oh and thanks for doing the meme – six little words can say such a lot! 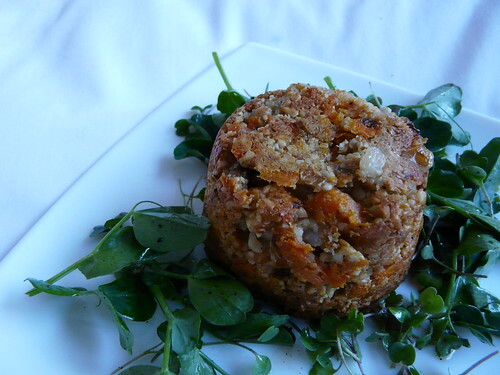 Hi Wendy, I like the presentation of your nut roast! The ramekins were a great idea and something other than hummus to use my tahini in. You see, not only is this vegan, but it’s light and full of veg. I knew you’d make something I’d love. Gonna give it a go for lunch today. Wow, Wendy! That looks so delicious and healthful. I’ve never made a nut roast, but you’re certainly giving me reason to try. what a lovely looking nut roast! I haven’t had the heart yet to post Bridie’s obituary, but will in the near future. Thanks again for sharing those lovely pictures of Rosie with us. Such a scamp! Lovely nut roast Wendy. I like the idea of individual ones and you’ve used tahini. Could imagine myself making this. It’s a fantastic roast indeed. I’ve never tasted a nut roast but you make me want to try it!! 🙂 It looks delicious! I’ve never had nut roast either, but seeing your picture definitely makes me want to try it. Thanks for the tag Wendy! I’ve never eaten a nut roast before either. Cumin carrot and cashew sounds like a wonderful meaty (am I allowed to say meaty?!) combo. Johanna – Thanks for hosting the event. Looking forward to the round up. Lucy – Oh, do let me know how it goes. I had the leftovers cold today and they were great that way too. Kim – I tend to take lots of Rosie pics whenever she comes to stay (she’s my brother’s dog) so expect more! Kathryn – Thank you. Let me know what you think! Sylvie – I wasn’t happy with the photo at all. Glad it’s good enough to make you want to eat it! Fabulous pictures, and I like your take on the words! I keep seeing these nut roasts that I have never heard of before Johanna posted her event. I have not made one yet, and even if I do not, I am looking forward to her roundup. Your ingredients look great and I am liking the idea of using it as an appetizer instead of a whole loaf. Nice presentation! That is one beautiful timbale! You have elevated the nutroast to glamour-girl status. I’ve never attempted one, either, but that will change soon. Thanks! I love the six words that you chose to describe yourself–what a wonderful combination. Have you tried rearranging them? I hope spring has sprung and all is well. Last meal of bread around here for a bit, ‘cos it’s Passover. But not for me. I’ll be eating leftovers for a few days! Christina – Hee hee. The rearrangement works too! And it’s springing right now. Not that you’d know it by the temperature. Lucy – Fantastic. Enjoy those leftovers. I love the look of these–single-serve nut roasts! The combination of ingredients is also right up my alley. I’ll definitely give this one a try, too! Oh sooo cool! I am gonna make this nut roast! Wendy, I made these little roasts last weekend and they were lovely – thank you!